Such a lovely collection. As you have mentioned earlier, we are very much on the same page, both last year and our conclusions! 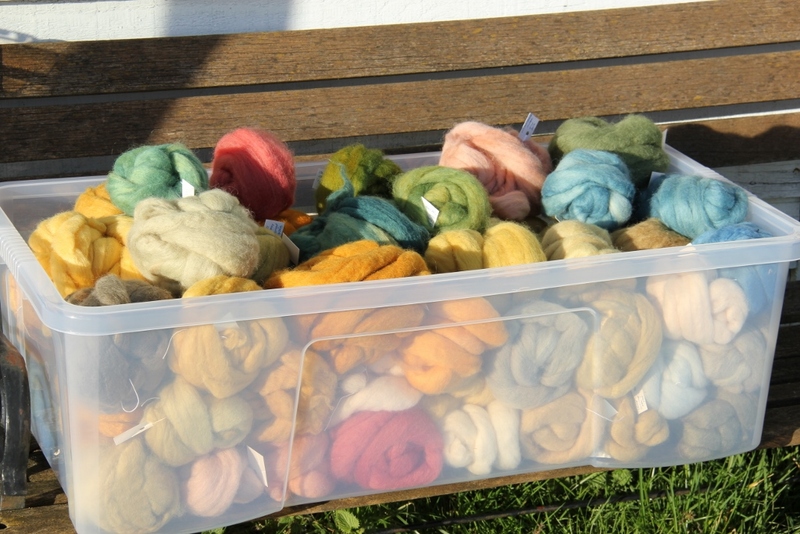 I’ve been dyeing lumps of raw fleece two years in a row and still haven’t gotten round to carding it, so I’ll give that a miss this year. I’m going to try the orange cosmos, but I think that will be my only new dye plant. I still don’t have any yarn actually. 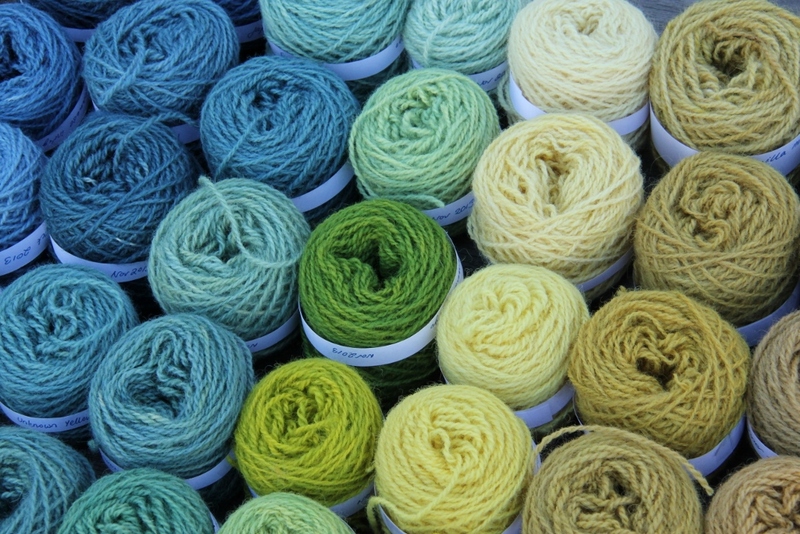 The skeins I have left are booked already for madder among other things. If I can find my list of variations…. 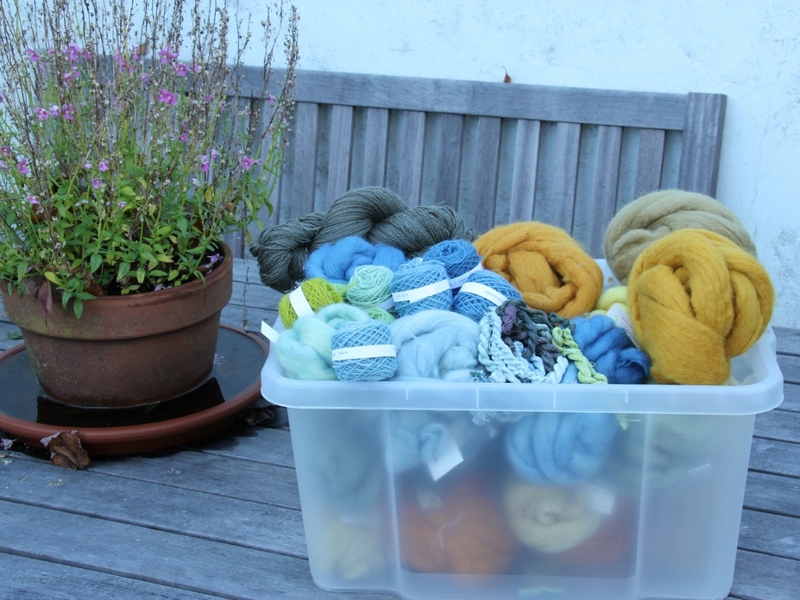 Yes our thought processes about dyeing seem to be evolving along the same path 🙂 And I too will be having less ambitious plans for the garden this summer, last summer it just took over and left time for nothing else. OMG. My eyes just popped out of my head. Not only are the colours beautiful, but if this is what you accomplish when you’re not feeling great, then the world better watch out when you are tip-top again. Holy monkey. I am very impressed and think you are wonderful. I hope this year brings you abundant good health. aah, I’m almost blushing now, that’s such a lovely compliment 🙂 Thank you so much! I suppose it’s true what they say: even big mountains are climbed one step at the time, so even if you can only make progress slowly, in small steps, as long as you keep going then you’ll be amazed at what you can achieve. Amazing, what an impressive undertaking! The hues look beautiful. Wow! These colours are delectable. Congratulations on all you have acheived, especially facing such intense challenges with your health. A feast for the eye, mind and soul. Exquisite colors, wonderful workmanship, excellent craft know-how. Congratulations! I love the colours you’ve got , more subtle aren’t they compared with Procion dyes. Can’t wait to get started when it’s a bit cooler :-). I’m a sewer so I’ll be using cotton fabric more than wool so it will be interesting to see if there is a lot if difference. 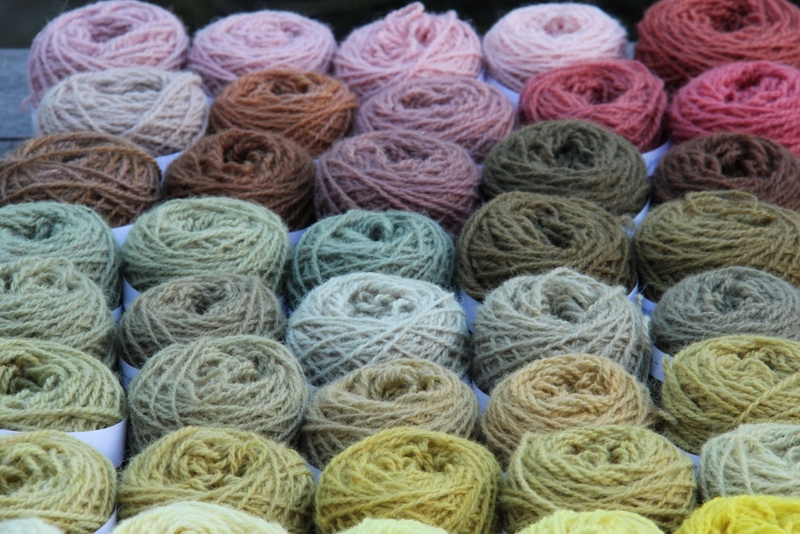 I too like the subtle colours you get from natural dyes, that’s why I like them so much. I too like sewing but I haven’t got as far as trying to dye cotton fabric with natural dyes, but it’s still very much on my list. 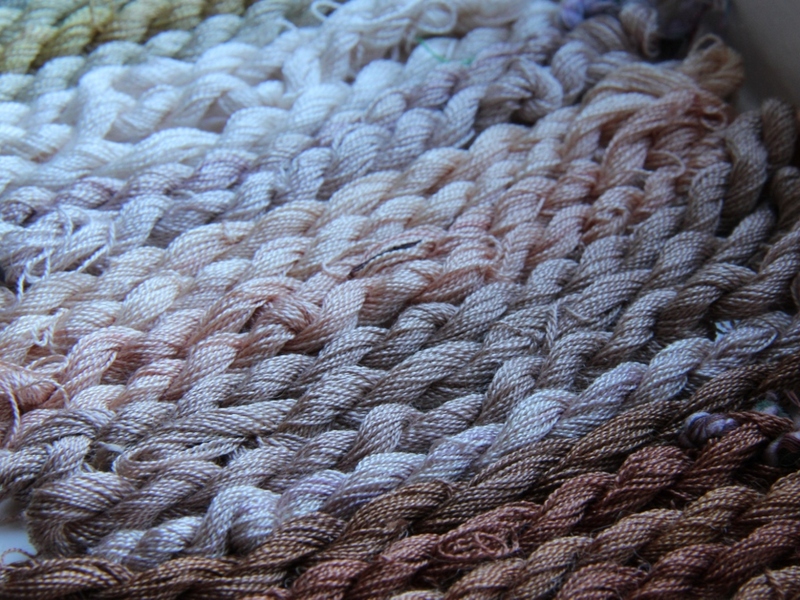 The scouring and mordanting process is different and I believe that cotton doesn’t always absorb the dye quite so strongly as wool and silk do, so with some dyes at least you may get lighter colours. Another trick with fabric dyeing is how to make the colour even (assuming that’s what you want) so careful scouring is important as well as using a pot that is big enough so that the fabric can move freely. 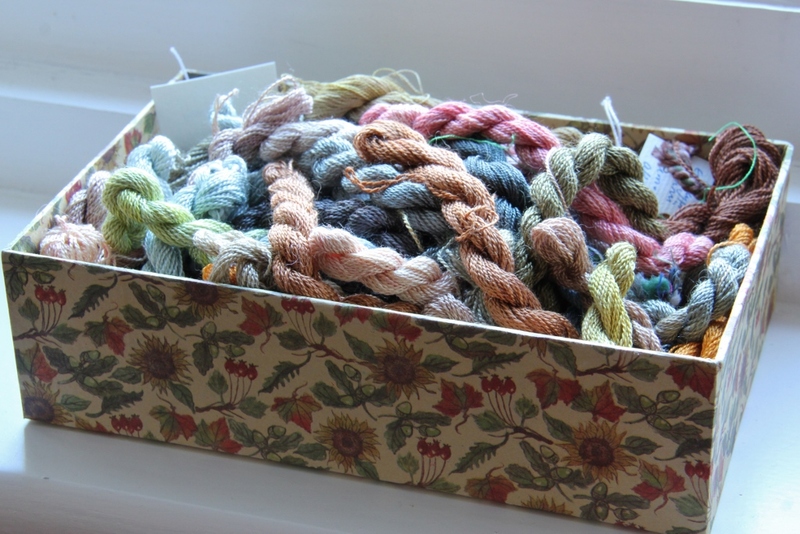 I’ve been trying natural dyes with varying mordants, I’ve made up a bunch of “sample bits” with squares of of cotton fabric, linen fabric and satin fabric; wool thread, cotton thread and synthetic thread. 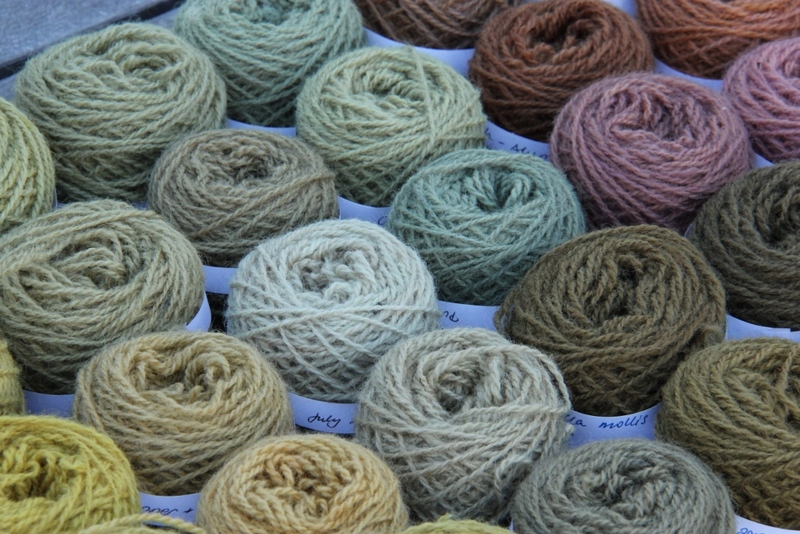 I am finding that in a lot of cases the wool thread picks up the dye the best by far, followed by the satin fabric; often the cotton and linen pick up hardly any dye. I’d be interested to hear how your experiments go though. 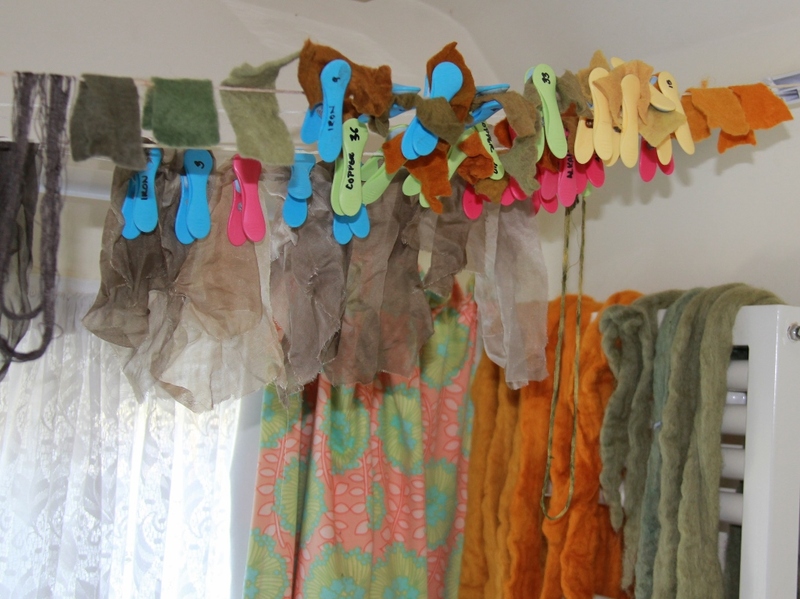 I too have started throwing in small squares of different types of fabric (silk, cotton, linen) into my dye baths. My cotton and linen samples have picked up colour fairly well although they typically tend to be a bit lighter than the wool and silk samples. I mordant my cotton and linen with aluminium acetate – how do you mordant yours? Unfortunately my dyeing experiments (as well as most other crafty activities) have ground to a halt for the moment due to health issues. 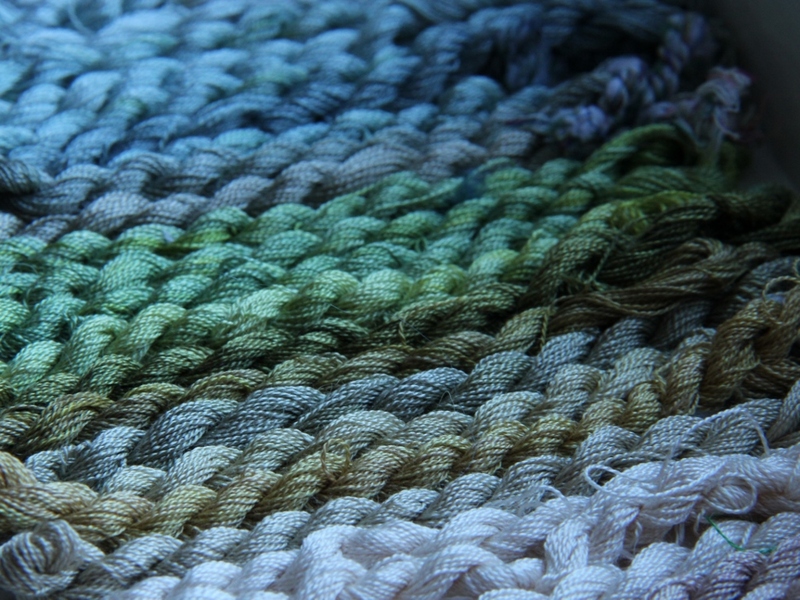 But once I am a bit better I am thinking about trying cold water synthetic dyes like fibre reactive dyes, as I am hoping that way I could continue my colour experiments in a slightly less strenuous way. Thank you so much Cristinaemilia for your kind words 🙂 Unfortunately I’m not strong enough to do much dyeing at the moment but I am practising colour blending with my drum carder at the moment, that way I still get to play with colour! I hope you will be well enough to do all those projects that you dream about this summer! It is wonderful to see all your work at knce. They are really lovely, I had no idea about overdying, so I learned something new!! Do you have another blog? I love your work. Thanks Heidi. I will follow on Instagram I hope you are better soon!